Ok so this whole Herculean blizzard thing is not my cup of tea. I much prefer snow to cold rain, but I much prefer positive temperatures to negative ones. The windchill in Chicago is supposed to be more than -20 today so I'm hunkering down and keeping warm with some comfort food. I first tried pierogi's from my roommate Megan at school. They are a Pittsburgh staple. Basically its like a big ravioli with potatoes and other things like cheese or veggies in it. Just plain good stick to your bones comfort food. When I found them in my grocer's freezer I decided to make them for my family. They are traditionally eaten with onions and polish sausage. We had some red pepper so I added that to add some color. I started by cooking the polish sausage in pieces in its own pan. You can also buy cooked kielbasa which is much easier and faster to heat up than cooking it. In another pan I started cooking down the onions and peppers. You can also add other veggies like carrots or broccoli. Basically whatever you feel like eating. After those had cooked down some, I added in the frozen pierogies and cooked them until they were warmed through and slightly browned. Serve on a plate with the kielbasa. Delicious, warm, and it could be slightly healthy if you add in lots of veggies. Perfect comfort food for this cold! 1. In one pan, start to cook the meat. If its uncooked sausage you may need to add a little bit of water to the bottom of the pan so it will cook easier. 2. In a separate large skillet, cook the veggies with 2 T olive oil. Add in the frozen pierogies and cook until the outsides are slightly browned. Season with salt and pepper. Make sure to cut into one and make sure the insides are warm. 3. 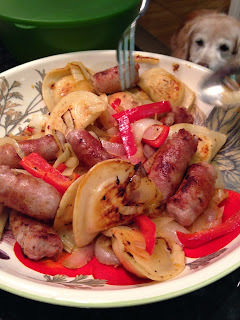 Combine the meat with the pierogies and veggies and voila! *Note: This is also supposed to be very good grilled, but theres no way I'm trying that in the cold. Also if you buy precooked sausage, you can cook it all in one pan.